The National Cyber Summit Job Fair is a terrific opportunity for cyber security pros to meet recruiters and hiring managers from leading employers. This aspect of the Summit gives job seekers access to key contacts all in one room. To make the most of these opportunities you need to plan ahead and put some strategies into place to create the best possible impression. Whether you’re currently seeking a job or scoping out future possibilities, your goal should be to put your best foot forward and network with as many people as possible. Follow these strategic ideas for job fair success. Joshua Crumbaugh, CEO of PeopleSec and upcoming speaker at National Cyber Summit in 2019, visits with CSC News, and shows just how easy it is to take over a person’s account through social engineering. Crumbaugh proceeds to change the user’s account, add additional services, updates pin numbers and passwords. National Cyber Summit is the nations’ most innovative cyber security-technology event, offering unique educational, collaborative and workforce development opportunities for industry visionaries and rising leaders. Our core focus is on two things: accessibility and connectivity. To learn more about social engineering and how to protect your company from being a victim of a hack, be sure to register for this year’s NCS June 4th through the 6th at the Von Braun Center in downtown Huntsville, Alabama. Cary Pool, National Cyber Summit Director for this year’s event was recently interviewed by WHNT19 News Anchor Steve Johnson. Mr. Pool discusses hacker tactics, techniques, and procedures and that hackers will persist to get into your system(s). This year’s summit will take place June 4th through the 6th at the Von Braun Center in downtown Huntsville, Alabama. Pool states the objective of the Summit is “to get all the industries together so we can learn from each other and we can be stronger together to defend this nation”. The National Cyber Summit is back for 2019, and bigger than ever! Huntsville’s CBS affiliate, WHNT News 19, recently spoke with NCS President, Cary Pool about Cybersecurity in today’s landscape and the upcoming NCS event. To read more about NCS2019, please visit https://whnt.com/?s=cyber. Think about the average day in the life of many Americans. They wake up, likely with a cell phone alarm, and turn on the TV to catch some news on a “smart” TV. While making breakfast, they discover they’re short on a few key ingredients for dinner, so they ask a virtual assistant to order some groceries for delivery. Read more. The Cyber Cup Challenge is back at the 2018 National Cyber Summit June 5-7 at the Von Braun Center in Huntsville, Alabama, with more than $14,000 in scholarships and prizes available to winning teams! The event aims to inspire technical skillset development through fun security-focused competitions and is open to high school students, college students and professionals. Teams will participate in one of three rounds. Each round will be four hours (8-12, 1-5 on June 6 and 8-12 on June 7). The top three teams from those rounds will win the 1st, 2nd, and 3rd place in each of the two categories (Student and Professional).You may have multiple teams from the same institution or company. The Cyber Cup Challenge is sponsored by BTI and the U.S. Army ROTC. Regardless of your background, this year’s event will provide an excellent opportunity to have fun, learn, and test your abilities to effectively navigate today’s challenging cyber environments, while also networking with industry leaders. The demand for cyber security professionals is ever increasing. 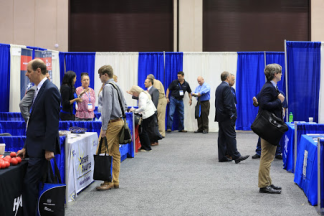 A local effort to reduce that employment gap and connect cyber security professionals and students with employers is the National Cyber Summit Cyber Job Fair, held Wednesday, June 6, from 11 a.m. to 3 p.m., on the second day of the National Cyber Summit at the Von Braun Center in Huntsville. The Cyber Job Fair is a hiring event for cleared and non-cleared cybersecurity professionals as well as college-level students in a cybersecurity degree program. Hosted by ClearJobs.Net and CyberSecJobs.com, the job fair features national and local employers filling cyber security positions including Decisive Analytics, Deloitte, Fulcrum, IBM, Parsons, Pacific Northwest National Laboratory, SAIC, Scientific Research and more. Alabama state senate has approved a bill to establish the Alabama School of Cyber Technology and Engineering in Huntsville. It will operate as a public magnet school for students in grades 7-12, and any student from Alabama can apply for admittance. "Our goal is to establish the best cyber engineering high school in the nation,” said State Sen. Arthur Orr. “Huntsville is the perfect location — the Tennessee Valley has one of the highest rates of engineers per capita in the country, and there are dozens of brilliant engineering faculty members and graduate students at the University of Alabama in Huntsville." The Alabama School for Cyber Technology and Engineering will eventually have an enrollment of approximately 300 students from around the state. "With the Marshall Space Flight Center and Redstone Arsenal, Alabama is at the forefront of engineering and technological research,” said Gov. Kay Ivey. “(The school) will position Alabama as a leading education hub for cyber research and engineering in America. I appreciate Senator Orr’s leadership in moving this bill through the Alabama Senate." The National Cyber Summit celebrates International Women’s Day with Elena Kvochko, Renee Wynn, and Margaret Isler- just a few of the amazing women speakers to meet and learn from at the 2018 National Cyber Summit! Elena Kvochko is a cybersecurity thought leader. She has authored numerous publications and reports and has contributed to Forbes, The New York Times, Harvard Business Review, and other media outlets. Renee Wynn is the chief information officer at NASA and has had a long career in the federal government. She has managed program administration for science, information management, and international programs; regulatory management; budget formulation and execution; contracts, grants and interagency agreements; long term strategic planning and analyses; and environmental and administrative policy. Margaret Isler is the head of risk at Google Technical Services. She previously served as a senior associate at Booz Allen Hamilton. Check back soon on www.nationalcybersummit.com as more speakers will be announced for this year’s event!